Arapahoe Basin, CO – Officials with the White River National Forest on Monday approved an expansion proposed by A-Basin into The Beavers. 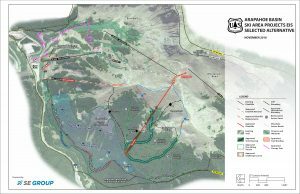 The additional 338 acres of terrain, west of the existing ski area and prized by local sidecountry enthusiasts, is part of Arapahoe Basin’s Master Plan accepted by the Forest Service in 2012. The terrain is a mix of intermediate and advanced, with high alpine in Beaver Bowl at the top, and tree skiing and several cut trails lower down. A new fixed-grip triple or quad Beavers chairlift will return skiers to the summit of Lenawee Mountain, at the top of the resort, and an egress route will be cut back to the bottom of the Pallivacini chair. Also brought in-bounds will be a popular sidecountry area known as the Steep Gullies, which will require a hike back to Pallivacini along the egress route. Also approved by Monday’s decision are replacements for the resort’s Pallivacini and Molly Hogan lifts with chairlifts of similar capacity, as well as a new 360-foot surface lift from the top of Lenawee to the top of Montezuma Bowl, eliminating an current uphill walk. The Norway chair, which will no longer be needed, will be removed once the Beavers lift is installed and Pallivacini replaced. 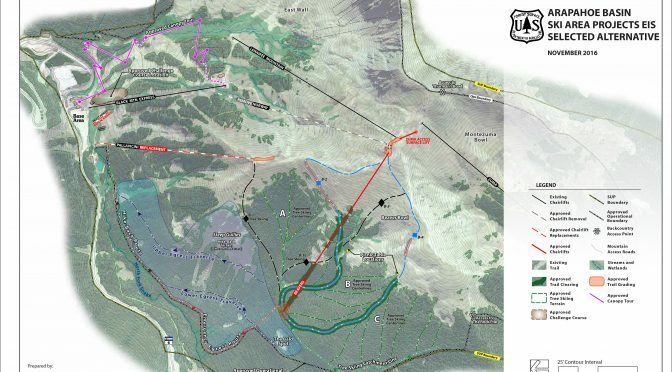 An Aerial Adventure Tour was also approved, following the resort’s existing Chisholm and Wrangler ski trails, along with a skills-based challenge course to be located east of the lower section of Black Mountain Express chairlift within a series of tree islands. No timeline for construction has yet been released by resort officials.